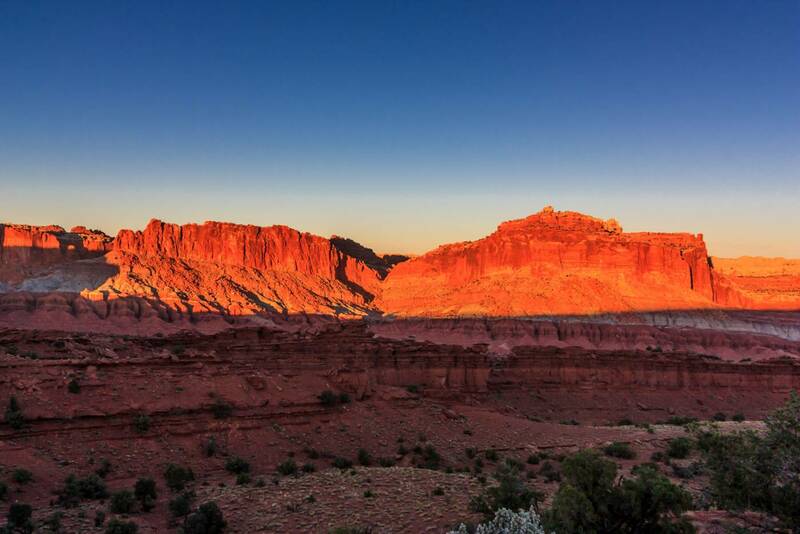 Capital Reef is a pretty spectacular place. Like Zion, it is a lush green valley set among the red rock. But instead of a valley, the dominating geological feature is the Waterpocket Fold, which is nearly one hundred miles long. This huge fold in the Earth presented such a barrier to Westward expansion that it was called a reef. The Mormons lived here too, and planted orchards. 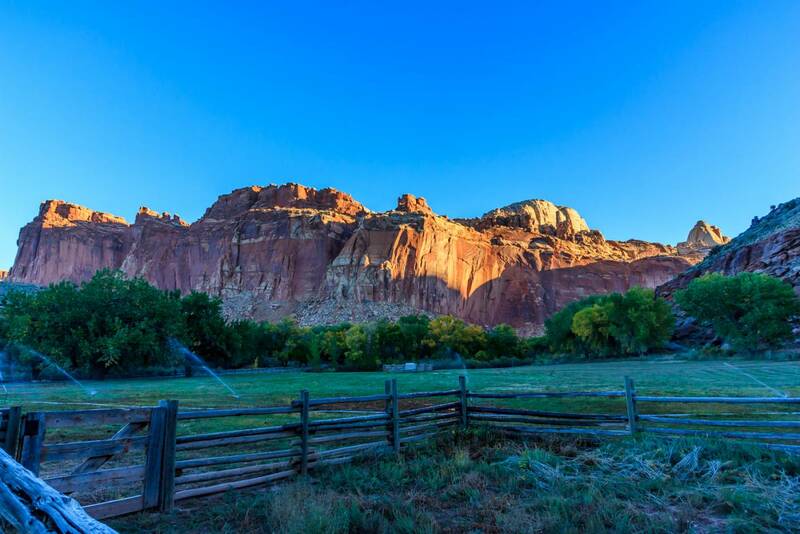 The settlement is call Fruita, and the orchards are still there, and are open to all. The Frutia campground is set among the orchards, and I started each day here with freshly baked apple pie. It was fun to explore the historic buildings in this strange setting. As amazing as Capital Reef is, I was a little burned out from my adventures in Grand Staircase-Escalante National Monument. I resolved to take it (relatively) easy. I only did a few short hikes. My biggest activity was to devote an entire day to “driving the fold,” doing a huge loop around the cliffs. Not only did this give me some much-needed rest, it turned out to be really interesting. The road went around to the back of the fold, which most people don’t go to. The road eventually turned into the dirt Burr Trail Road, named for the mule trail created by a settler named Burr. It climbed high up the cliffs via a series of steep switchbacks. It was actually a bit scary, and I wasn’t able to enjoy the scenery because I didn’t want to look over the edge. But once I got to the top I got out and marveled at how high I was. 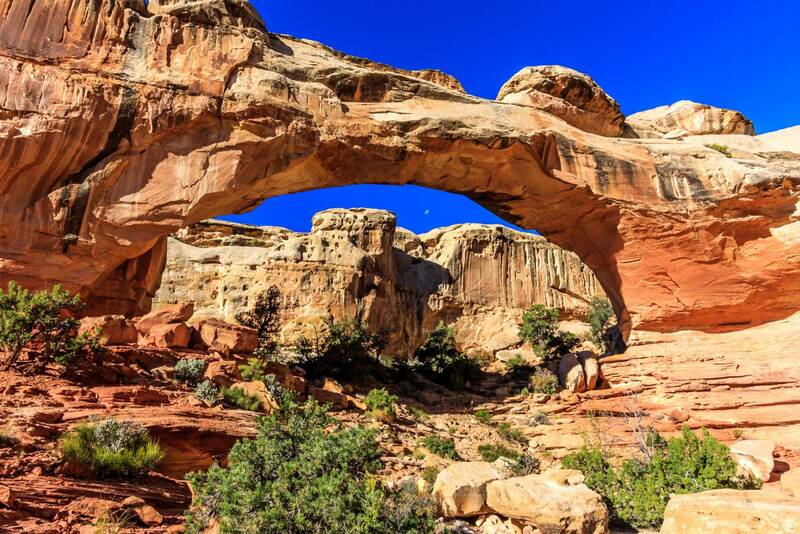 The road crossed into Grand Staircase-Escalante and became spectacular. There were red cliffs and badlands. The road followed a green gulch with high red cliffs. Once again it was hard to enjoy the scenery, because I didn’t want to drive off the cliff. But I stopped when I could to take pictures. The drive went through the little town of Boulder, which was a chance to visit the Anasazi Museum, which preserved a small Ancestral Puebloan excavation site. This would be a prelude to my visit to Mesa Verde National Park. The drive finished by going over Boulder Mountain through Dixie National Forrest. The views were amazing, with golden leaves and sweeping views of the red cliffs below. 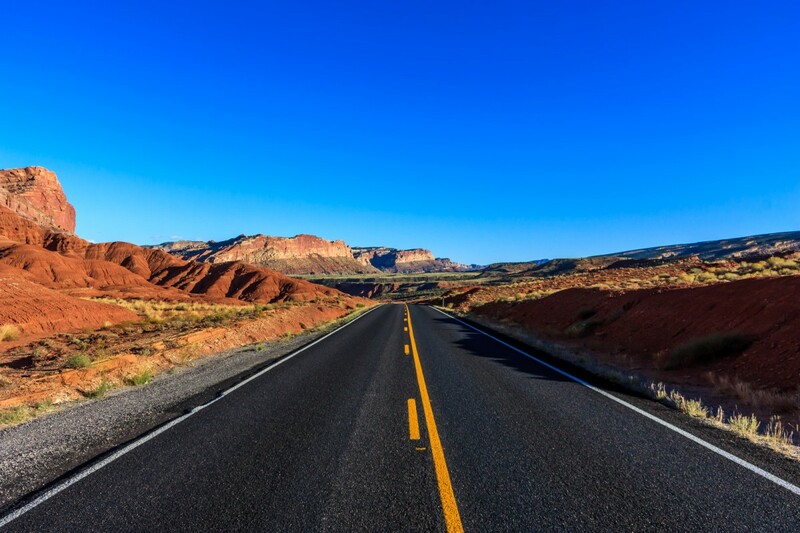 Driving the fold is a great way to spend a day in Capital Reef National Park. 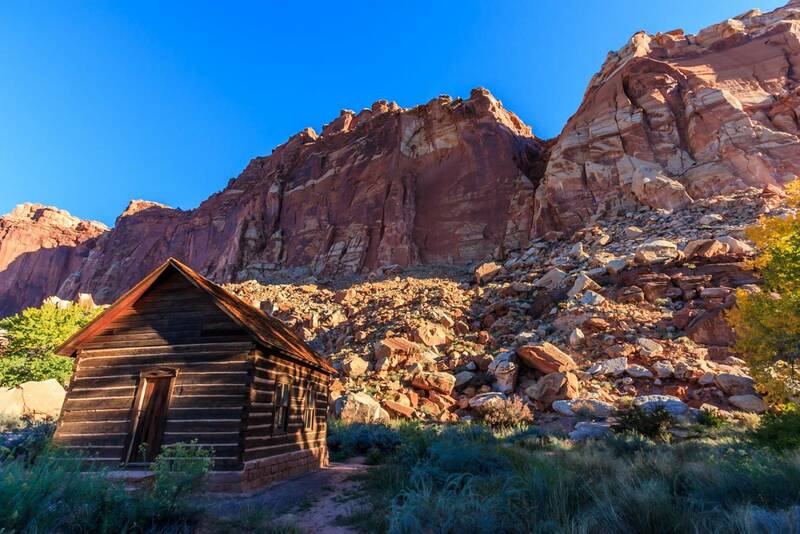 This cabin used to be a schoolhouse. I got up early and had this arch all to myself. The fold glows before sunset. The landscape is quite rugged. Thank you for sharing your photos and story. 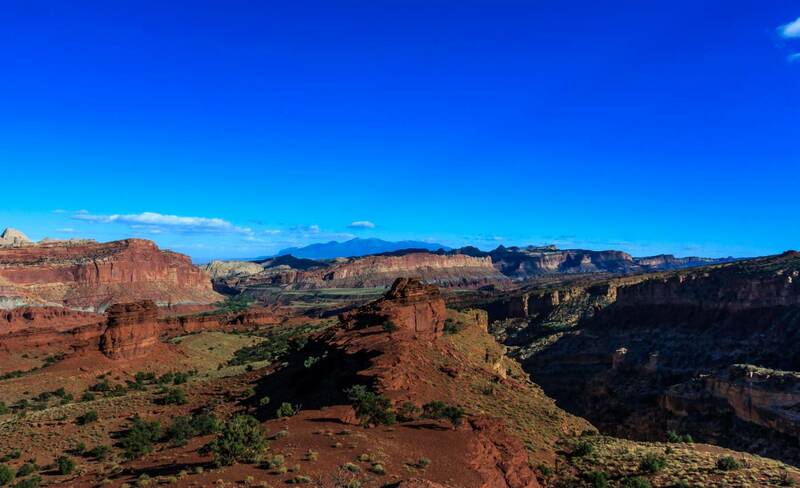 Capital Reef was on my list last year when I did a lot of hiking in southern Utah canyons. We traveled for 54 days but didn’t get there. Not a problem though, we’ll just need to go again. It’s definitely worth a return visit!